Scythe Mugen 4 PCGH Edition was able to defend it's position at renowned hardware.info Netherlands "CPU cooler (air) of the Year" survey. We want to thank harware.info readers for their continued support and their faith in our company an in our products. The Fuma, Scythes newest cooler model, was tested by Hardware.Info and received the recommendation along with "EXCELLENT" award. The extraordinary high cooling performance and the attractive price, compared to his fellow campaigners, has been highlighted. 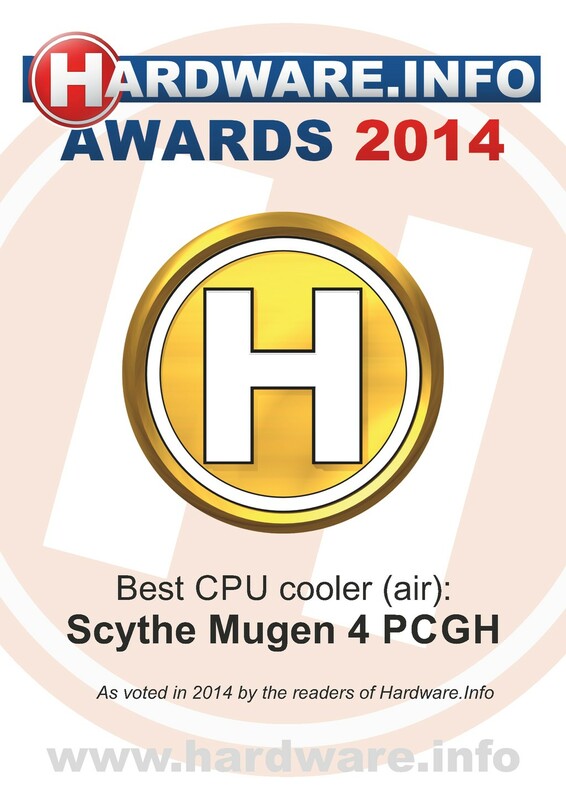 At the elections of Hardware.info’s „Cooler oft he Year“ the Scythe Mugen 4 PCGH prevailed over his competitors and was voted into first place as best (air) cooler. We would like to thank all participants for their trust. During the big fan test of Hardware.info the Scythe SlipStream (SY1225SL12M) achieved a bronze award, the Kaze Ultra (DFS123812H-3000) even won a silver award. Both fans particularly stood out in the categories of air flow, volume and price. Scythe is one of the world's leading manufacturers of CPU coolers, graphic card coolers, fans, fan controllers, power supplies, cases and other PC accessories. Operating since November 2002, is headquartered in Tokyo (Japan) and has offices in Oststeinbek (Germany), Los Angeles (USA) and Taipei (Taiwan).